Aeris in FFVII was a bit timid and docile when she first met Cloud, but she became an icon easily because of her interesting design and her back story. She may seem like a damsel in distress but Aeris holds a lot more than that and can be considered a strong heroine that has the strength to commend to a sacrifice. There has been a lot of information on her in the past years, especially with new FFVII games being released. 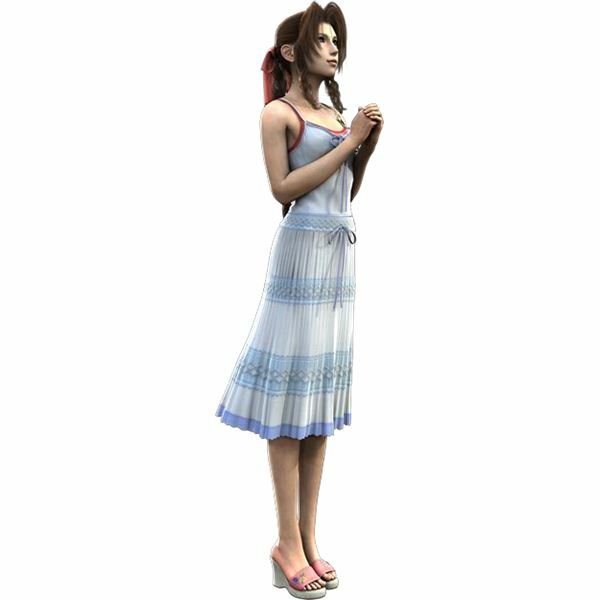 Aeris Gainsborough (also known as Aerith to Japanese fans) was born February 7th, 1985 to professor Gast and her Cetra mother, Ifalna. Another professor who was against Gast, professor Hojo, blasted through the research lab and killed Gast, snatching away Ifalna and her twenty day old baby. Mother and child were to be kept in separate locked cages and were used for experiments being conducting on the Cetra and why they held so much power. In 1992, Ifalna and the 7 year old Aeris escaped the Shinra research lab, but it wasn’t without a fight. Aeris’ mother was gravely injured and died right at the train station’s platform. A middle aged woman was waiting at the train for her husband’s return from the war, only to find the dying woman and a young child. Ifalna asked the woman, named Elmyra, to care for the youthful Aeris to which she had accepted. Aeris was raised by Elmyra for years, living in the sector 5 slums of the industrial city of Midgar. She watched over flowers that grew in an abandoned church, where she felt comfort. During the events of the game, Aeris meets Cloud Strife as he falls through the slum church’s roof and into the flower bed. The elite group of Shinra, the Turks, turn out to be looking for a half Cetra and realize it’s the girl they see walking out with Cloud. Cloud and Aeris fend them off as well as trying to escape, and finally make it to a secluded playground. Aeris asks Cloud to be her protector from Shinra and he agrees to it. All through out the story, Aeris was there to protect the team that forms up with Cloud, including the resistance, a young red lion, a Wutai thief, and a battle hardened pilot. When the team learns that Sephiroth, the source evil, is heading to the temple of the ancients things get rough. Aeris goes on ahead by herself to pray at the temple, asking for the help of the ancients to group together and restore the planet from the powers of the black materia. Unfortunately, the party arrived too late as they witnessed Sephiroth murder her brutally. The group made it their sole purpose to defeat Sephiroth and bring back order to the world as a means of revenge for killing Aeris. Aeris meets Zack, a Shinra soldier in the same manner she meets Cloud years later, falling from the church’s roof. They see each other through out the five year span and Zack tells her to make money by selling flowers on the street, which becomes a hit in the slums. Aeris writes Zack eighty nine letters, although he had only received one about her stating that her flower selling is doing well. As many fans know, the end of Crisis Core shows Zack getting gunned down by Shinra soldiers with Aeris sensing that he has died, while she is tending her flowers at the church. Aeris also makes a post death appearance in the animated CG movie Advent Children, where Cloud hears her voice in his head making it clear it wasn’t his fault that she had died. She can be seen at the end of the movie as a spirit with Zack in tow. She has also appeared in the Square Enix and Disney game, Kingdom Hearts as a small town flower girl. Final Fantasy VII Aeris has made an impact in Final Fantasy games as well as the gaming industry itself.